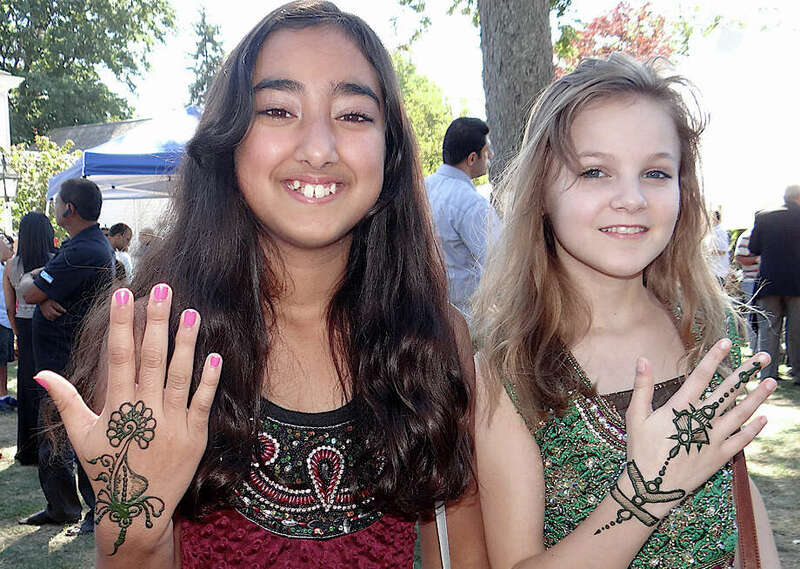 Ria Narula and Juliet Nannariello, both 11, show off new henna tattoos at the 7th annual Heritage India Festival Sunday on Town Hall Green. Town Hall Green was transformed Sunday afternoon by a mix of colorful costumes, elegant dances, pungent flavors, beautiful faces and imported products at the 7th annual Heritage India Festival, presented by the Hindu Cultural Center of Stratford. Vendors of apparel, jewelry, tapestries and home decor shared their wares, while visitors enjoyed meals provided by area Indian restaurants. In front of old Town Hall, dancers in bright attire and jeweled headdresses performed centuries-old routines. Under sunny fall skies, the fest shone brightly -- a jewel of Fairfield.